The Delaware River Port Authority announced Tuesday that the Benjamin Franklin Bridge will light up for several days to honor the victims of the Orlando shooting massacre at Pulse nightclub. 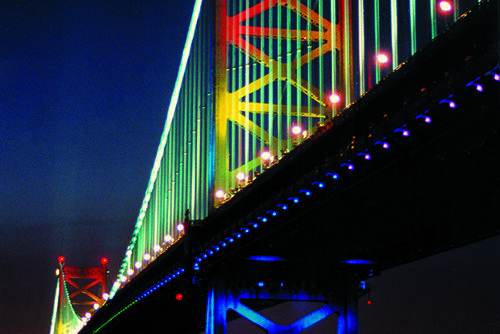 "Standing in solidarity with the victims of the Orlando shooting, the Ben Franklin Bridge will illuminate in rainbow colors on Wednesday, June 15 through Saturday, June 18," the DRPA said in a release. Philadelphia's iconic bridge will join in the tribute shared at buildings, bridges and other structures worldwide. Forty-nine people were killed and another 53 were wounded in Sunday's attack, the most deadly shooting massacre in modern U.S. history. On Monday night, thousands of Philadelphians converged on City Hall for a memorial to honor the victims and denounce violent acts of hatred. An FBI investigation into the shooter remains ongoing.